An AutoModeller source is basically the equivalent of a 2D bitmap texture. You can use it to texture a target using its underlying UV- mapping and a specified UV-channel. A source should always be front-facing. You can save a source to the AutoModeller/Textures directory by clicking on the save-symbol. This can then be loaded by opening the TextureLibrary and clicking on the Load-From-File button. it. 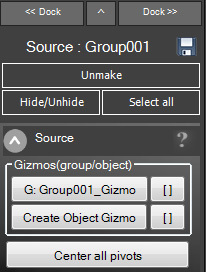 Also Hide/Unhide will quickly change the hidden state of all the elements in the source(including gizmos). Select all will select all elements of the source(including gizmos). The gizmo buttons show the active group- and object- gizmo in use for this source. Clicking the buttons will either create a gizmo that fits the group/object or modify the existing gizmo to fit to the source. The small buttons on the right to the gizmo buttons will select the gizmo(ctrl+g will select group gizmo).